Nea Smyrni Stadium was built in 1939. The stadium was initially completely uncovered, mainly consisted of terraces, and could hold approximately 20,000 fans. 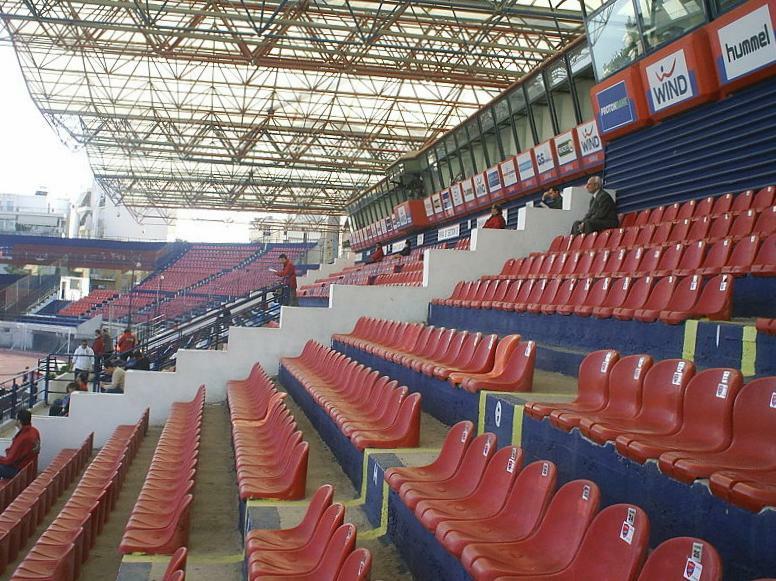 Capacity got reduced in the late 1990s when the stadium got converted into an all-seater. Further refurbishments were made in the following years, including a roof and VIP facilities on the main stand. The stadium has the shape of a horseshoe as there is no stand at the northern end. Nea Smyrni Stadium is located in the Nea Smyrni area about 4 kilometres south of the city centre of Athens. It would take about 45 minutes to walk from the southern edge of the city centre (south of the Acropolis) to the stadium, or 30 minutes from metro station Neos Kosmos, which is on line M2. With less walking, the stadium can be reached by tram or bus. Tram line T4 and T5 connect the city centre with the stadium. You can catch the tram from Syntagma Square, or, for example, from Leoforos Vouliagmenis in the south of the centre. Get off at stop Megalou Alexandrou, from where it’s a small walk to the stadium. The journey from Syntagma takes 17 minutes. Line T4 continues to Piraeus’ Karaiskakis Stadium. Alternatively, bus 10 passes the stadium on Leof. Andrea Siggrou avenue. One can catch the bus in the southern part of Athens’ city centre (on the same avenue). Get off at stop ΣΚΡΑ or ΧΡΥΣΑΚΗ. The stadium lies a few blocks away to the left. Bus 106 furthermore can be taken from the same spot as bus 10. Get off at stop ΛΕΟΝΤΕΙΟΣ, which is one block from the stadium. Nea Smyrni Stadium is located in a typically Greek dense residential neighbourhood. It won’t be too hard to find a local restaurant, in particular in the area north of the stadium. There are few hotels in the area around the stadium, though the well-rated Athens Avenue Hotel and Athens Atrium Hotel, and the basic Hellenis Hotel are all at reasonable walking distance (15-20 minutes). A little further away and if you’ve got more money to spare, there’s the Athenaeum Intercontinental. Click here for an overview of hotels near Nea Smyrni Stadium, or here to explore options elsewhere in Athens. 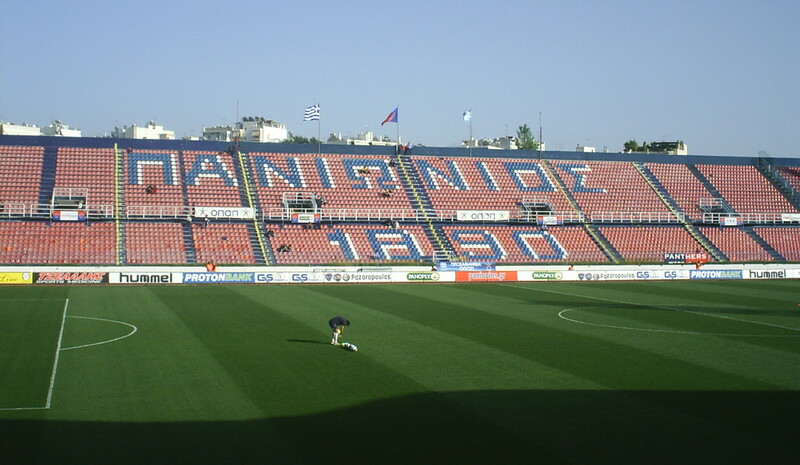 Tickets for Panionios matches can be bought at the ticket office at the stadium from a few days before the match. Tickets are also generally available on the gate on the day of the match. Restrictions can apply for a few high-profile matches. Ticket prices depend on the opponent, but typically range from €10.00 to €30.00. Pgss.gr – Official website of FC Panionios. Breathtakingathens.com – City of Athens official visitors guide. OASA.gr – Athens area public transport information. 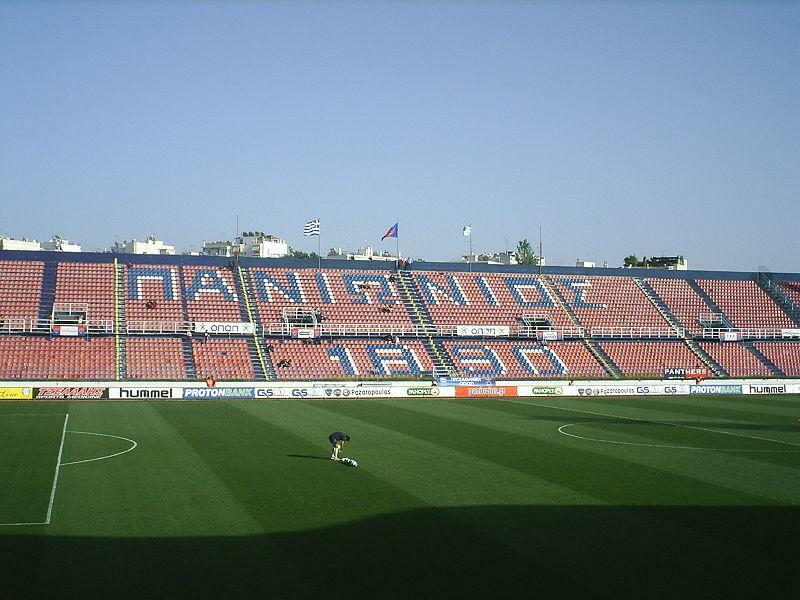 I went to watch Panionios against Olympiacos over the last weekend. Tickets are easily available on the day. Attendance was only 3000 against the Champions so I can not really see a sell-out game. Unfortunately away supporters are banned from attending the games in Greek league what impacted the atmosphere. It was still very good game with nice atmosphere. Cheapest tickets were for 15 Euros but I do not think anybody wants to sit with the ultras. So the next cheapest option is a ticket for 20. Very good view, but seats are not comfortable at all. To get to Nea Smyrni I took a metro to Neos Kosmos(Red Line) and then tram to Megalou Alexandrou. The stadium lies about 5-minut walk from the stop.